Did you have heatshrink on the wires and solder joints for the clash sensor? It can ground out against the hilt and fry parts or the whole board. Always be sure to heatshrink every exposed part of wire or solder joints. I would say that the sensor grounded out or that the recharge port was wired incorrectly or bad. I have had some recharge ports go bad before and cause issues. I mounted the clash sensor to the board. Pretty sure that wasn't touching the hilt. But as I said in my previous post, I'm pretty sure one of my swing sensors was touching the hilt. So is that what did it? Does it make sense that it would work fine but only fry when I plugged in the charger? I verified the charge port was wired properly and works fine, out of the hilt anyway. Last edited by Ka'getsu; 12-18-2011 at 02:38 AM. I'll probably do that with my new board. I'm giving up on this one as I get no swing or clash even with everything out of the hilt, even bypassing the charge port, and even with new sensors. I must have fried something somehow (maybe because of that swing sensor touching the hilt) when I plugged in the charger for the first time. That's my only guess, unless someone else has a better one. I've done for that for years with the older versions, and never had any problems with the boards. The heart required to shrink most heat shrink tubing isn't enough to damage the board or the board's components. Ok, I'm REALLY frustrated now. I bought a new board, wired it up same as before, tested it about 2 or 3 times along the way to make sure everything was working properly, which it was. Hooked it up to the charger multiple time throughout also, with no problems. Had everything really insulated well and absolutely zero exposed wires to be touching the hilt. Fired it up after install was complete and everything worked great. So I set it down and left to eat dinner with the fam. When I came back down, it was turning on and off and making the clash and swing sounds over and over by itself. On...clash...swing...clash...clash...off...on...of f...on... clash...clash...swing...off...on... you get the idea. I couldn't get it to shut off. I didn't think about plugging in the charger to shut power off to the board. Instead I started quickly taking it apart and while doing so I destoyed my charge port!!! AHHHHHHH!!!!!! So I took off the charge port and just wired the battery straight to the board and beep... beep... 'til I disconnect. Thought it might my switch so I cut it off. It still beeps and even comes on without the switch connected or wired. I'm at a complete loss. 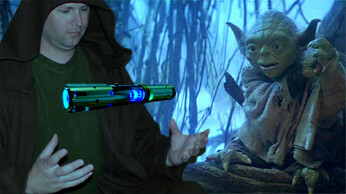 The other saber I built using the obi-wan econo board was a breeze and it's been working perfectly without a hitch. This was supposed to be one of my kids Christmas presents for tomorrow! Does anybody have any advice or guesses as to what the $%&*#@! happened this time? Last edited by jvidamins; 12-25-2011 at 12:06 AM. I would guess that one thing that has not changed throughout your problems is that battery. It could be malfunctioning. It is bad to solder directly to them like that they can get damaged. I would try another battery that you know is good and make sure it can maintain voltage under a load. Those boards are known for bad solder joints and wires will very easily get bad connections or come completely off. I always take all the hot glue off and remove ALL the wires and then resolder my own wires. Also remember to double check that the jumpers for the demo/off/on mode are wired correctly or it can cause strange problems. I removed the hot glue and replaced the wires with my own both times. The demo part is wired as in your video. Also, the battery I'm using was used to test my other board (Obi-wan econo) and has consistent voltage output. The only thing I can think of is that I forgot to check before was my led wires had a bit too much insulation trimmed off and were touching the edge of the led star a bit. Not sure if that could cause all these problems or not. Wade, how many of these new boards have you successfully used? Have you ever had any problems like this?